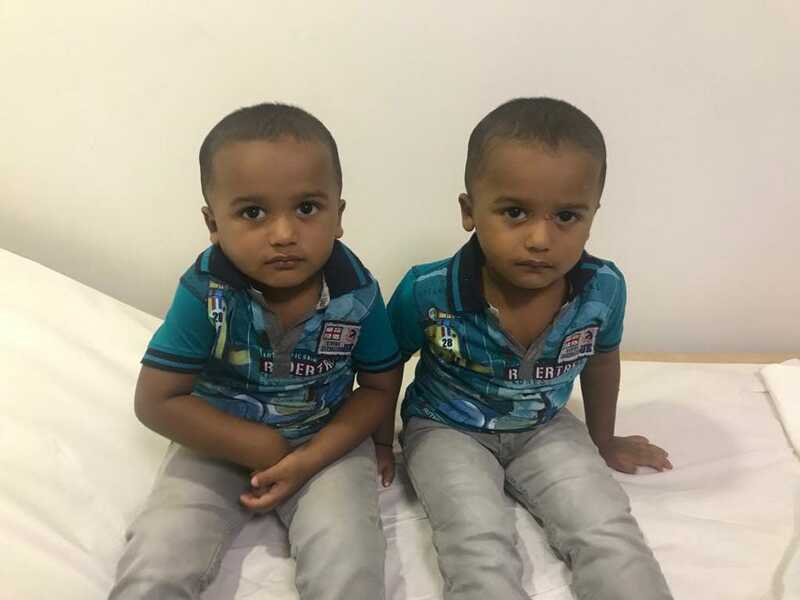 Hubail and Hilal are both 1 year and 8 months old. A few weeks ago, Hubail fell sick. He began vomiting anything he ate. Even after taking medicines, he did not show any improvement. 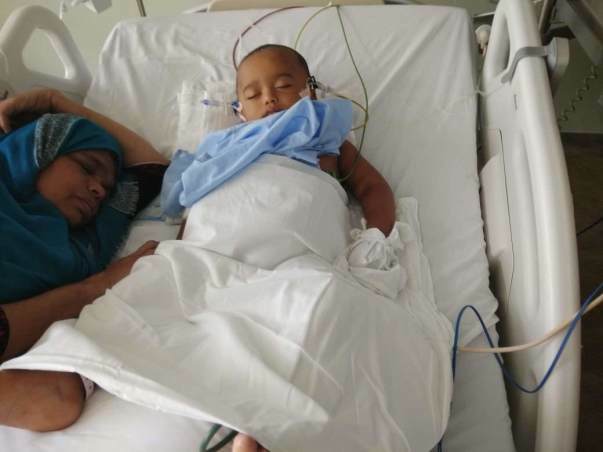 To make things worse, Hilal began to show the same symptoms, and both their conditions got worse until they were on the hospital bed diagnosed with acute liver failure. 25-year-old Ameer Ali landed a job as a school bus driver in UAE just 2 months ago. The family had been facing financial troubles, and with this job, he hoped to turn things around. 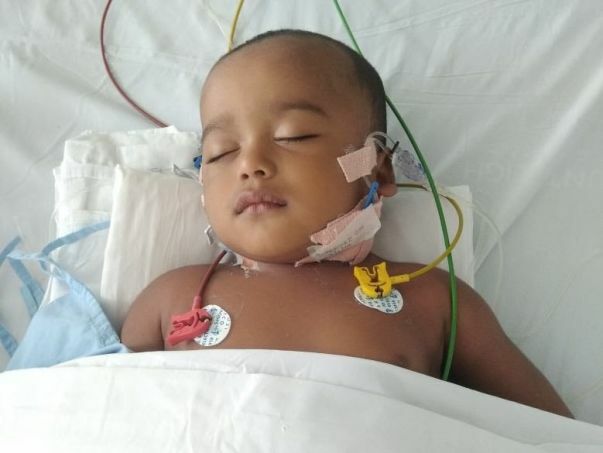 When Sumaiyath mentioned that Hubail was sick, Ameer suggested taking him to the hospital. A local doctor prescribed medicines presuming it might be an infection and this did not help. Ameer tried to come back, but he would lose their only source of income. Right when he decided to return, Hubail and Hilal’s condition deteriorated. They had to be rushed to Aster in an ambulance. After a second evaluation, Hubail and Hilal were given 10% chance of survival. They needed an immediate liver transplant. 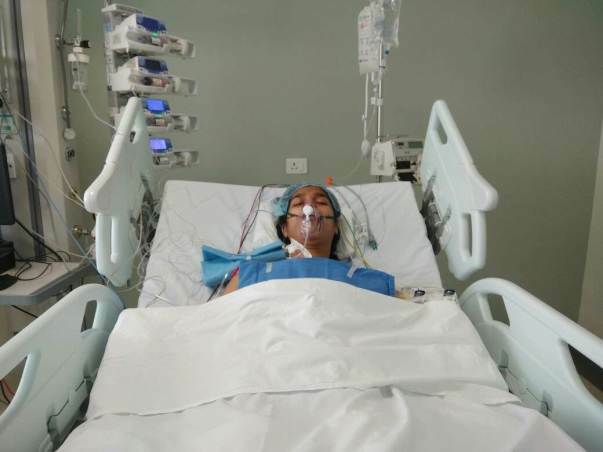 Hubail is currently on the ventilator. He has been in tremendous pain, and is now sedated. 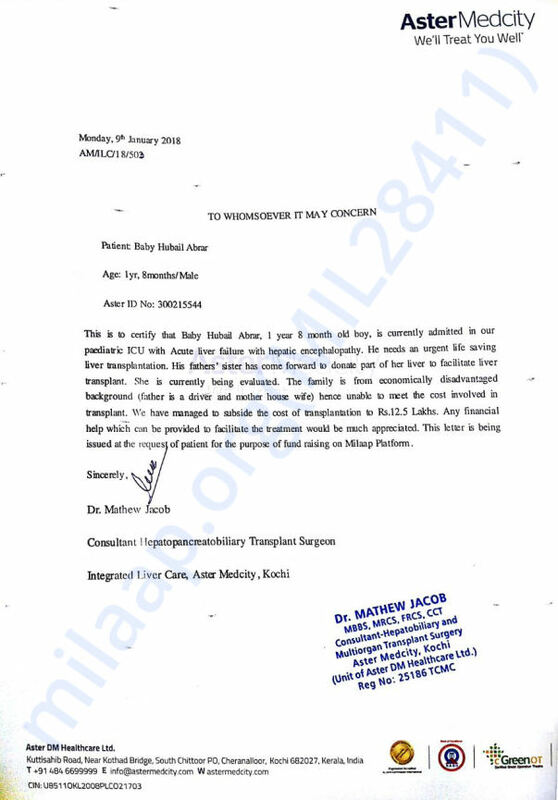 Ameer and Sumaiyath will lose him if they cannot fund another liver transplant within 24 hours. 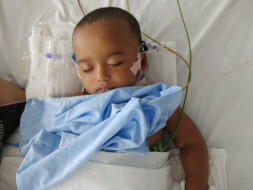 All they have been able to afford so far are medicines to keep him alive. 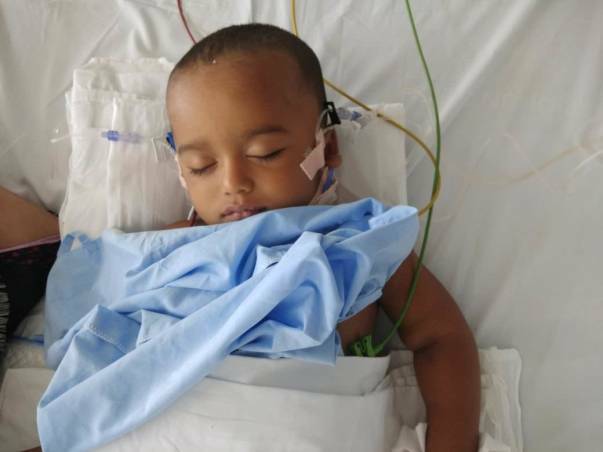 Your contribution can help these parents save Hubail from a terrible fate. Disclaimer: 100% of funds raised will be transferred towards Hubail's treatment. Every contribution will be matched to raise funds faster and help little Hubail. This fundraiser campaign is supported by The Pravin Agarwal Fund. Here's a recent update on Hubali. Hubail is doing very well . Here is a recent picture of him when he came for a follow up. This is Hubail with his twin- Hilal who also underwent the transplant. Hubail is now doing well post his discharge. He is slowly becoming active and is responding well to the medication. The doctors have told us that he will be on medication till they advise us otherwise. We went for a checkup a week before Ramazan and there were no irregularities in his health. Thank you everyone for your support. We are extremely thrilled. It gives me immense pleasure in informing you all that Hubail has now been discharged from the hospital and is doing much better now. The doctor says he is well now and only has to go for a checkup next month. He is currently on medication and will be undergoing a blood test once a month. It's wonderful to have him back home. Please keep praying for his speedy recovery.